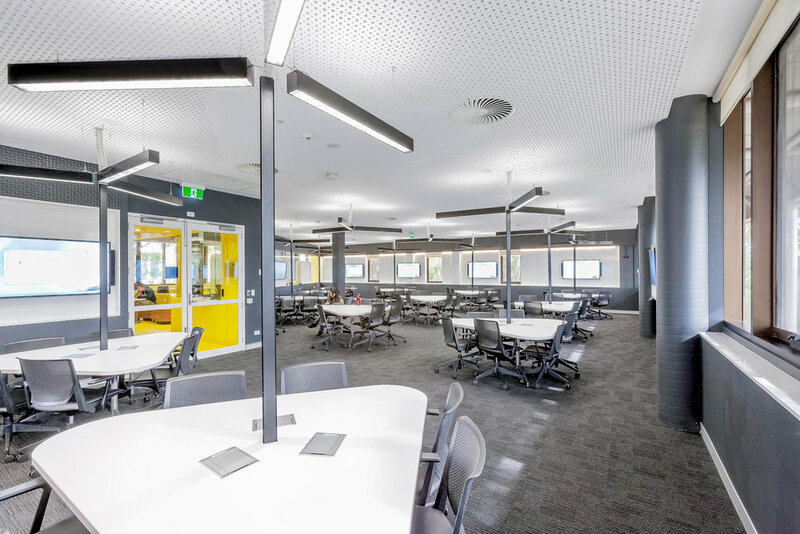 Paul Morgan Architects’ RMIT University, Building 205 Teaching Spaces, Bundoora Campus provides a flexible learning environment alternative to orthodox ‘chalk and talk’ teaching supporting individual self-paced learning, classroom learning, syndicate learning and lectures. Supports collaborative, project-based learning spaces in both classrooms and portal/ break-out spaces. This project provides a flexible learning environment offering an alternative to the orthodox ‘chalk and talk’ teaching with configurations for individual self-paced learning, classroom learning, syndicate learning and lectures. The acoustic ceiling mirrors the shape of the pod tables and provides direct lighting: each of these ‘pods’ provides a quiet isolated environment for individual groups to work. Teaching aids include writable glass, white boards, data projection, wi-fi and laptops. Benefits of project-based learning also apply to the break-out spaces which provide a place for informal learning and social interaction — they can also be utilized as informal teaching areas. 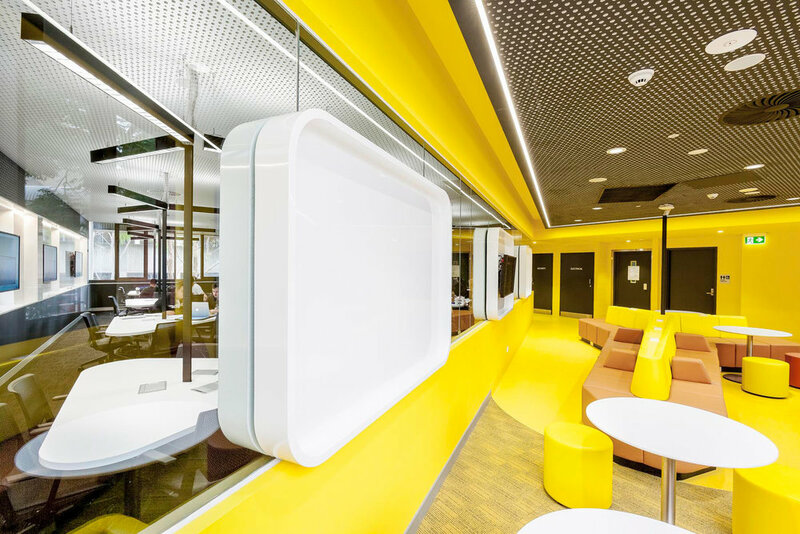 The design of these immersive, vivid and engaging spaces recognises that the teaching and learning evolution is student focused, and acknowledges the ‘stickiness’ that campuses now require. Stickiness refers to expanding the amount of time that students remain on campus, which yields a myriad of social and pedagogical benefits, particularly for an outer metropolitan campus such as Bundoora. Break-out spaces are designed to make teaching and learning visible from all rooms and corridors. The design brings light and views to the deep interior, encouraging students to stay inside. This ‘sticky campus’ approach provides breakout spaces that foster social learning for brainstorming, shared study and discussion. Furniture is flexible and customisable and can be modified in accord with individual learning requirements while built-in seating creates privacy between groups.